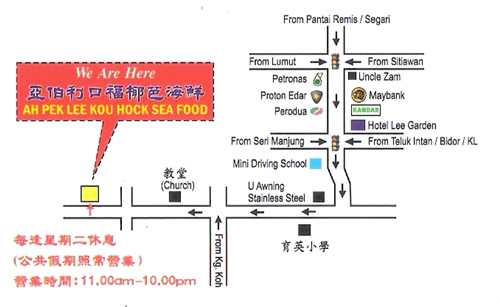 We reached Ah Pek Lee Kou Hock Seafood Restaurant at about 1pm. The restaurant was empty. But when we sat down and ordered, customers started to fill up the small, modest village restaurant. Kampung Cina – where Ah Pek Lee Kou Hock Seafood Restaurant and a string of other restaurants are located – is a food haven for those who are looking for mouth-watering seafood at irresistible prices. Again, this place was recommended to me by Wang Tao. We were supposed to have dinner here last night but we changed plan. Ah Pek Lee Kou Hock Seafood Restaurant, which was originally started just to sell tuak (an alcoholic drink made from fermented coconut flower sap) and later moved on to include other food to go with the drink. Tuak is still available if you want to have a sip of the local beer. We ordered four dishes: steamed ma yau fish, fried squids, fried fish (it is a popular dish here but I forget the name. The fish is small and long), steamed prawns, and vegetable. The ma yau fish was very fresh and I didn’t taste the “fishy” smell. It was very well done. The fish was sweet and tender. Not many restaurant can prepare nice and tasty fried squids. But this restaurant really impressed me. Not to mention the squids were fresh, the fried squids here were tender, juicy, and succulent. Overall the lunch was excellent and most importantly the price was highly affordable. Our bill came up to about RM60 – which was lower than what I expected judging from its popularity – which had recently shot up to sky after being featured on a local TV food program. According to owner Ling Hock Beng, they catch their own seafood. In other words, they control the supply chain right from the source. And that also explains the reason why the seafood offered here is fresh and cheap. Note: This is the eighth article of Family Weekend Getaway: A Road Trip To Lumut series.